By turns inspiring and heart-breaking, hopeful and horrifying, I Shall Not Hate is Izzeldin Abuelaish's account of an extraordinary life. A Harvard-trained Palestinian doctor who was born and raised in the Jabalia refugee camp in the Gaza Strip and "who has devoted his life to medicine and reconciliation between Israelis and Palestinians" (New York Times), Abuelaish has been crossing the lines in the sand that divide Israelis and Palestinians for most of his life - as a physician who treats patients on both sides of the line, as a humanitarian who sees the need for improved health and education for women as the way forward in the Middle East. And, most recently, as the father whose daughters were killed by Israeli soldiers on January 16, 2009, during Israel's incursion into the Gaza Strip. His response to this tragedy made news and won him humanitarian awards around the world. Instead of seeking revenge or sinking into hatred, Abuelaish called for the people in the region to start talking to each other. His deepest hope is that his daughters will be "the last sacrifice on the road to peace between Palestinians and Israelis." 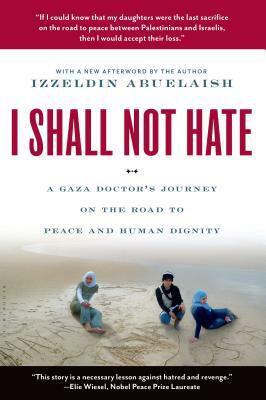 Izzeldin Abuelaish, MD, MPH is a three-time Nobel Peace Prize Nominee, and is often referred to as “the Gaza Doctor” in the media. He is a Palestinian medical doctor and infertility specialist who has dedicated his life to peace in the conflict between Israel and Palestine. He is the Founder and President of the Daughters for Life Foundation, a Canadian charity that provides awards and scholarships to young women in the Middle East in memory of his slain daughters. He gave a TED talk in which he says that his aim in establishing the Foundation was to give other young women the opportunity to fulfill his daughters' dreams for an educated future as agents of change in the journey towards peace. He now lives with his family in Canada, where he is an associate professor at the Dalla Lana School of Public Health at the University of Toronto. His website and foundation can be found at www.daughtersforlife.com.